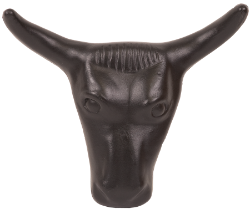 Finally a steer head tough enough to be made in Texas. Black plastic with 11 1/2” horn spread, complete with removable spikes. Steer head can be used by inserting the durable metal spikes into a bale of hay or attached to a steer head stand.